Above, Custom Multi-Photo Tile Plaque with Queen Anne Cherry Plaque and darkened laser engraving into the wood. 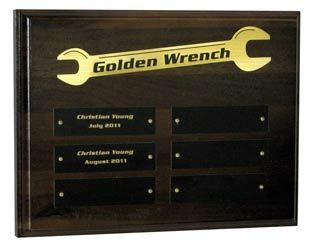 This can be accomplished with any solid wood plaque. Custom Plaque Boards! 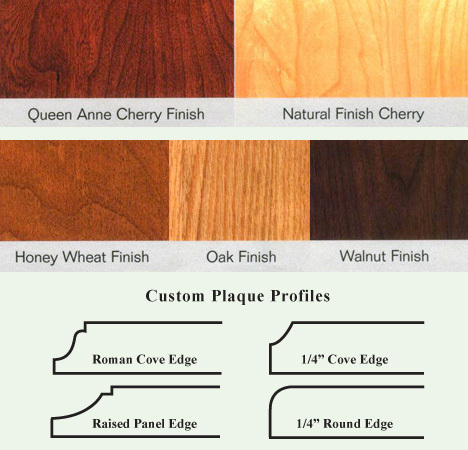 Choose the Size, Finish and Plaque Profile. Above, The Whisk to the City, Custom Plaque with a Whisk mounted by it's handle, the silver letters are paint filled and the bottom two lines, which are too small to paint fill are darkened to increase the contrast and readability. 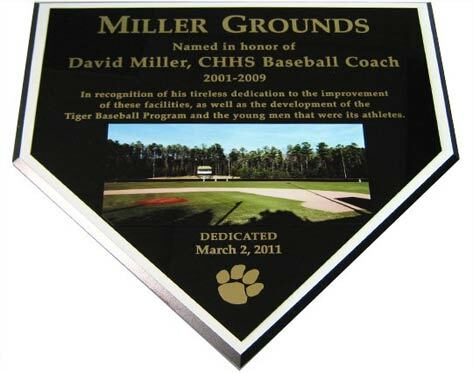 Above, This home plate plaque was created with a custom cut home plate shape which was laser engraved and a full color photograph printed on white aluminum and mounted on top of the black brass plate. 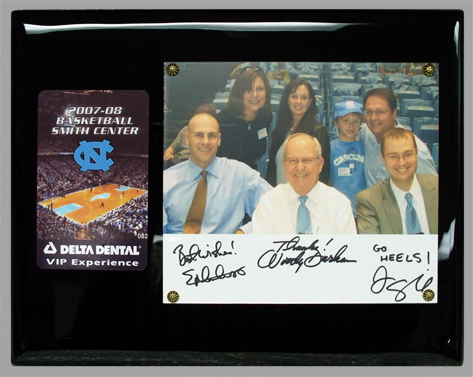 Above, Custom plaque prepared for Tarheel Sports Marketing, includes original signitures and photo mounted under acrylic with rossettes and a printed full color decal. Arranged on a 11" x 14" piano finish black board. Above is a sample of a custom photo plaque with digitally printed decal, photo mounted under acrylic with rosettes, and a laser engraved brass plate. 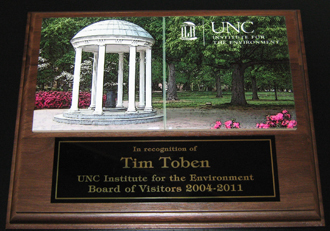 Plasti-Plak offers a great way to preserve your certificates, degrees or even newspaper clippings, plaques are encased in a smooth plastic surface. 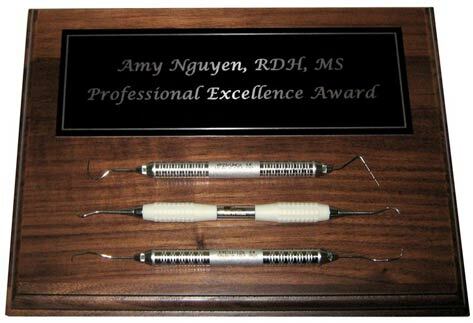 4 different plaque colors to choose from. Turn around time varies, but expect 4 to 6 weeks for most plasti-plak orders. 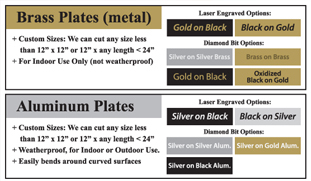 We offer a wide selection of engraving materials as well, see above for a few of our popular metal options, CLICK HERE to learn more about our materials for engraving!!! 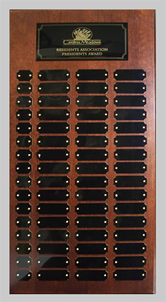 Click above to learn more about the custom solutions we have to offer with cast plaques. Above, here is another sample of a custom plaque where we used our laser engraver to route out a spot to glue the items brought in to the plque. We also used the black aluminum with the silver letter to match the silver tools. Custom Interior Sign with brush silver painted mica backing, green acrylic with beveled and polished edges, raised applique Suite B and applied vinyl office name, mounted with green standoffs. This sign can also include braille to make it ADA compliant when needed. 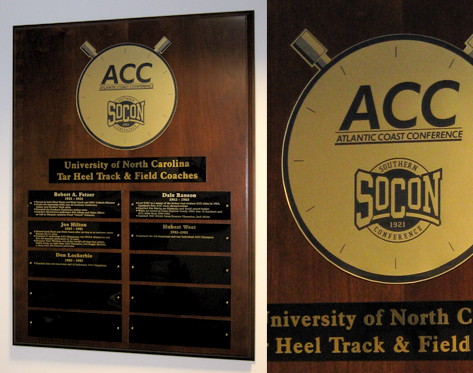 Here is an example of a custom perpetual plaque that we created for the UNC Track and Field Hall of Honor. In order to create a custom shaped header plate, we used a thin flexi plastic piece with a brushed gold metallic face with black engraved letters in combination with our standard black brass with a gold letter for the rest of the engraving. 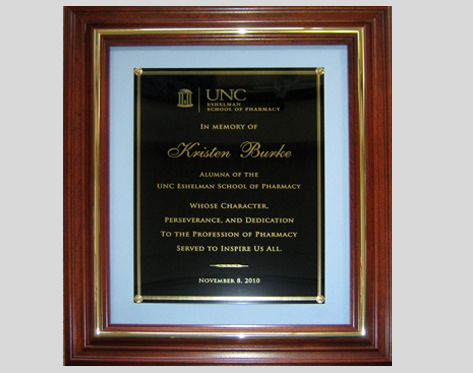 Above is an example of an engraved plaque with a custom Carolina Blue cloth backing plate, this can be customized with any color material you like. We offer a wide range of solutions for Custom Orders, including mounting photos under acrylic, full color decals and graphics, plaque finish and sizes, and much more, please call or email with any ideas or questions and we'll be glad to help you find the right fit. 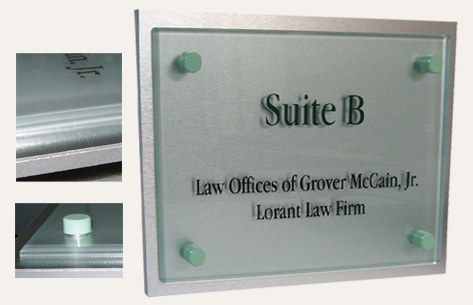 Custom Sized Beveled and Polished Acrylic Plaque with Laser Engraving and holes for silver standoffs to be mounted to the wall. A very nice modern look that can be laser engraved at sizes smaller than 12" x 24" or for larger pieces we can apply multi-color vinyl graphics. We can also create color photo ceramic tile plaques using our standard walnut plaque boards as shown above. 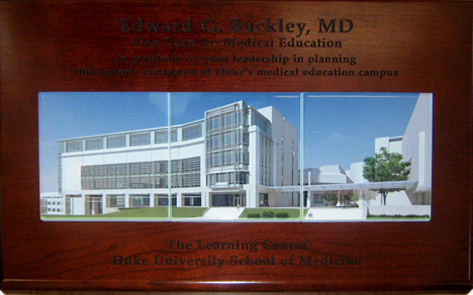 This plaque uses an 8x10 solid walnut plaque, a black brass plate that has been laser engraved and the 2 photo tiles with the old well graphic and department logo. 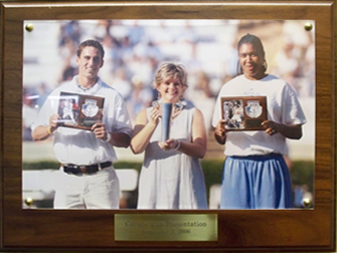 Above is a photo mounted under acrylic with an engraved brass plate, the photo is of the ceremony for the presentation of The Carlye Cup Award which also used a digital printed logo decal. 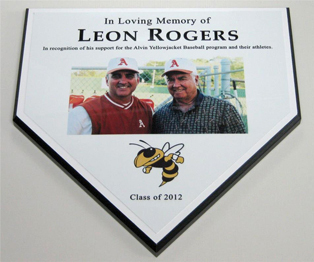 Above, We can also create a home plate plaque entirely on one piece of aluminum, white, silver or gold, and print color logos, text, and photos directly on the aluminum plate. Homeplate plaque baords available in 3 sizes. 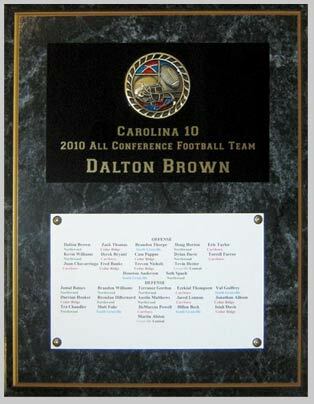 Above, Custom plaque with a large marble wood wrap plaque with gold border, a laser engraved plate and mounted mylar figure, and the roster printed and mounted under acrylic with rosettes in the corners. Above, Custom Shadow Box with mounted signed Jersey, engraved logo and inscription, cutout interlocking NC, and raised photos mounted on silver plastic. 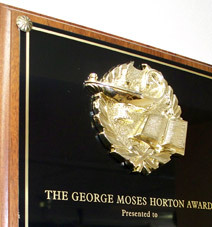 Above, we can create custom perptual plaques from standard size plaques, this sample uses a thin metallic faced laserable plastic we call Flexi, which has the distinct advantage of being able to cut unique shapes. Below, Custom Perpetual Plaque, custom size board and finish, custom plaque layout created right here in our engraving shop. We can print directly on White, Silver and Gold Aluminum Sheet Metal in FULL COLOR, including color photos and logos using a process called Sublimation. 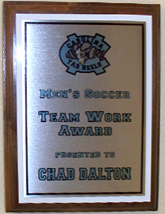 High Relief Mylars can be added to plaques, and are available for almost any event, occasion or sport. 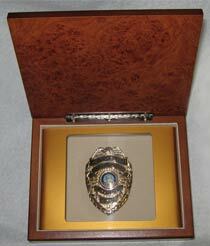 We offer a variety of sizes of keepsake boxes which can be converted into mini shadow boxes. In this sample we mounted the badge inside the box and created a curved plastic piece to fit inside the box with a window opening covered from the inside with thin clear acrylic. The top of the box is also laser engravable. 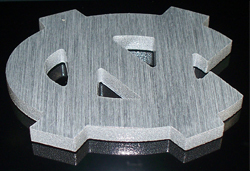 We can custom order Dimensional Logos and Letters at a wide range of sizes, the above is less than 3 inches wide, and was mounted at the top of an engraved plaque. We can also create custom cut metal and plastic plates to your specs. Please give us a call today to discuss some of these options. Depending on the time available we can order custom size plates or custom syle plates, but normally we create these in our shop when they are less then 12" x 12" in metal or 12"x 24" in plastic. We can mount medals on plaques with the ribbon. 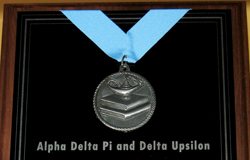 This example uses a Carolina Blue ribbon with a stock medallion. We have a wide variety of ribbon colors to choose from as well as medals, or we can often use medals brought in as well. 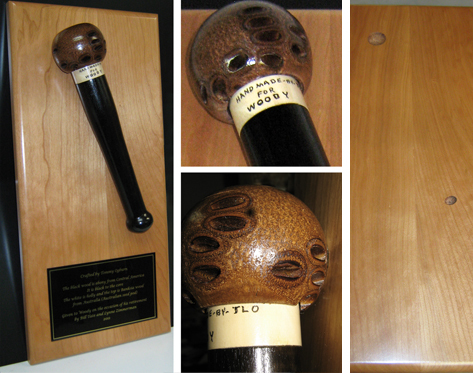 (Left) Here is a sample custom plaque that features a custom solid wood board with an engraved black brass plate and a mounted wooden microphone made by an artist for Woody Durham in honor of his retirement. We can mount nearly any item to a board, in this case we laser engraved two bowl shaped spots out of the board so that the microphone could sit flat and give it a little more surface area for the glue to hold it firmly. If you have an idea that you might want us to try please let us know and we are sure to find a unique and custom solution to exceed your expectations.